Peter Pan has got to be my favorite story of all time. Of. All. Time. If I ever go mad and deiced to spawn I want to start a tradition with my children including Peter Pan. I love the character Wendy. I love the fact that she's maternal yet has no desire to grow up. In that sense I can relate. For a while I've wanted to make her costume from Disney's Peter Pan because it could be easily recognized out and about on Halloween. I bought a couple patterns some time ago. I decided on one that was perfect and it wasn't even a nightgown pattern! 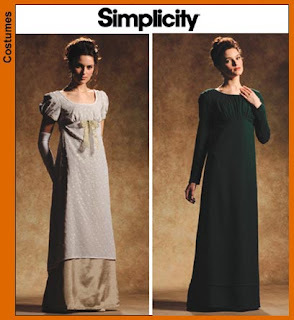 I used Simplicity 4055 and I combined aspects of both dresses to make Wendy's nightgown. I used a light blue flannel because hello it's supposed to be a nightgown! The pattern is quite simple. The only problem I had was the ribbon. It wouldn't stay in place so close to the girls. In the end I just sewed it on the front. I love your Wendy costume! I want one just like it. Do you ever sew orders for others? Could you make that pattern work for a LARGE bosom?